How Do People Choose Which Products to Buy? The MECLABS Institute has dedicated more than 15 years researching answers to questions like this. 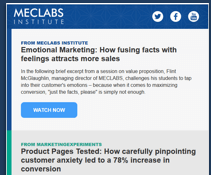 In this video, CEO and Managing Director Flint McGlaughlin introduces you to our decision-patterning research and shows you how to get the most value from this website. Educate your team through MECLABS in-person team training. Learn more about events featuring speakers from MECLABS Institute.